Discussion in 'Yanks Abroad' started by Dave Marino-Nachison, Oct 20, 2010. I'm told that Reid, a '94 striker, has an American father (and an English mother). Exeter City is in the third division this season. He Plays for the Reserves now and scored back in November. The fans at Exeter city are high on him. As a 94' he is eligible for the 2013 U-20. Looks like ECFC was relegated last year and will play in the fourth division for 2012/13. Reid scored three goals in 12 games on loan at Dorchester Town in Conference South this season. He's apparently back with Exeter and made the bench today. Playing fourth-division ball this year. Reid had a short loan at Truro City in the sixth tier during which he scored three goals in five games. Now he's back at Exeter and started their last game. 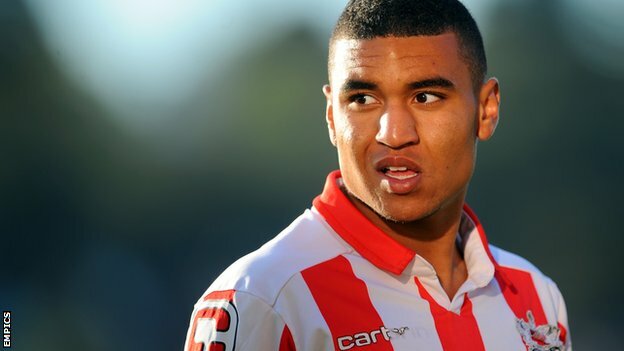 He's been on loan to Torquay United (Brendan Moore's club) in the National League, with 3 goals in 27 appearances. He's on another half-season loan to Torquay at the moment. Expires at the end of 2017. In October, Reid signed with Torquay permanently. Reid adds pace and trickery to United’s squad and can play either out wide or through the middle. He has shown that with his pace and persistence he can score regularly at this level. A local lad born in Torquay, Reid has proven his worth with some impressive performances. This has been a good move for Reid. Torquay United just clinched the National League South title, which means they will be back in the fifth tier next season. Reid leads the league with 28 goals. Dave Marino-Nachison and Winoman repped this. Is that the most goals ever for a Yank while playing for Torquay United? Here's a recent interview after a two-goal outing.